Sorry guys, I know I have not posted in a while but that is no reason to be hateful. I have had a crazy last couple of weeks and just have not found the time to post. After this weekend I should see a little relief...and I will post better for you all. But for the love, BE NICE. Anyway, I start with the personal trainer on Wednesday with my partner LLL, and I am really looking forward to that. I have not had a chance to get to the gym as much as I would like the last couple of weeks, but my family and I have been playing a lot outside to more active things than usual. 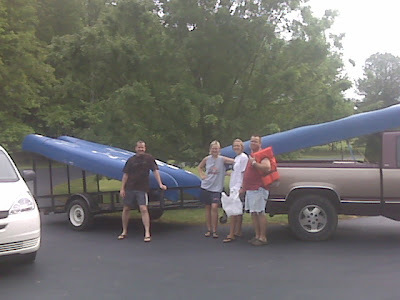 We swim and even went canoeing (look below for those pictures.) 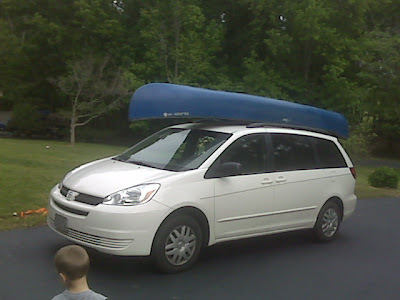 We have scheduled another canoe trip for a couple of weeks and got a trailer so we don't have to look that that again. I'm going to the wedding this weekend that I told you all about. I'm really excited about it and ready for it to be over. I have had nightmares about this wedding, I dreamed once that I missed the whole thing completely. So my mind will be at ease when this is over. So~ you probably wont hear from me for the next couple of days but I'll be back. I'm sure after a couple of visits with the trainer I will have some belly aching to do. Ill be here.